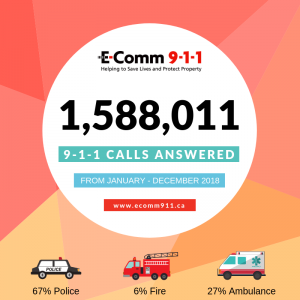 In 2018, we answered approximately 1.6 million 9-1-1 calls in BC! 98% of these calls have been answered in 5 seconds or less. Watch this video to learn more about our statistics. Find out more about our 9-1-1 call statistics. We also received a total of 42 Text with 9-1-1 (T9-1-1) calls in 2018. T9-1-1 is a specialized texting service available for people who are Deaf/Deaf-Blind, Hard-of Hearing or Speech Impaired (DHHSI) that allows registered users to communicate with 9-1-1 call-takers through text. Find out more about T9-1-1.